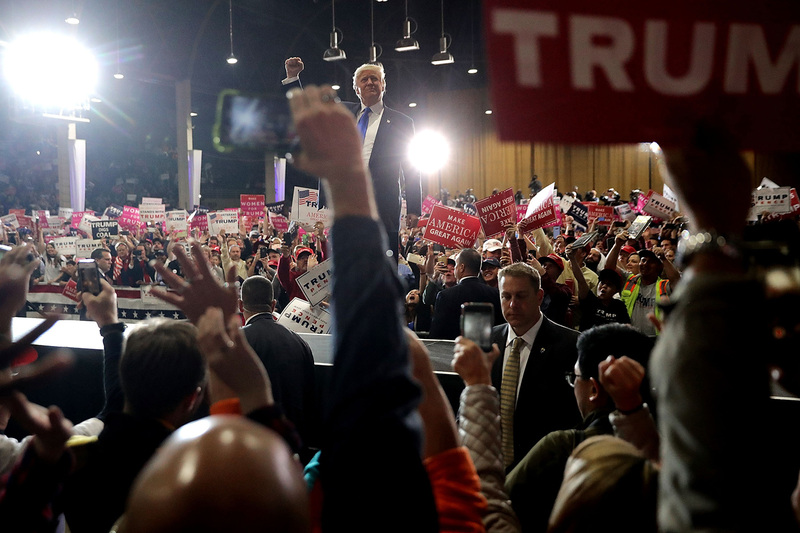 Donald Trump at a campaign rally in Denver, Colorado, November 5, 2016. Two days later, Trump won the United States presidential election. 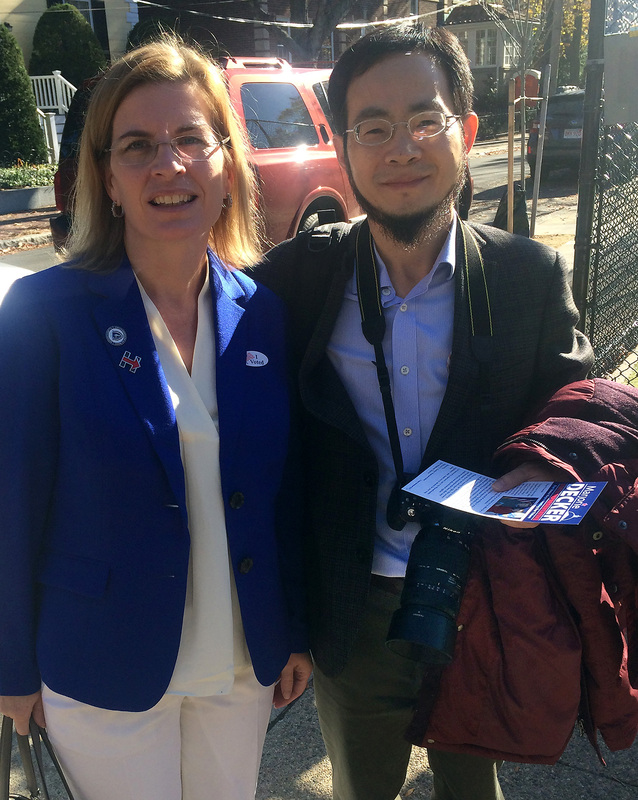 Democratic State Representative Marjorie C. Decker, of Cambridge, Massachusetts, stands with He Haibo on election day. He is spending the year at Harvard studying administrative and constitutional law and researching, writing about, and experiencing American democracy. In September, He blogged about his experience canvassing—in Chinese, the expression is “to pull votes”—in New Hampshire for the Democratic presidential nominee Hillary Clinton. A Chinese citizen, He cheerily knocked on doors and smiled as his two fellow canvassers, both Americans, asked the residents about their voting choices. A gentle listener with a mischievous smile, kind eyes, and a wispy, Lincolnesque beard, He marvels at the personal nature of American democracy, the handshaking, easy compliments, and selfies. And, comfortingly, over the turbulent 24 hours I spent with him, he also marvels at the structural integrity of the American system. Like many Chinese raised during the Mao years, when mass campaigns, sloganeering, and struggle sessions were regular features of life, politics got into He at an early age. But his positive association with politics come from his father, now deceased, who was the village head in He’s birthplace, a small village in the mountains of Zhejiang province in eastern China. “Some people in China, and in America, think that politics is evil,” but it doesn’t have to be if people’s interests are respected, he said. He describes his father as a patient, intelligent man, who educated and bettered his compatriots without patronizing them. “My father knew that Americans walked on the moon in 1969,” he told me. His fellow villagers, however, dismissed this as impossible; instead, they believed the tradition of the Cowherd and the Weavergirl, two mythical lovers who every year on July 7 reunite as two stars moving across the sky. On one July 7, to prove that the two stars did not travel the length of the sky to meet each other, He’s father stayed up all night with one of the doubting villagers, observing the movement of the stars.